The DTZ at the Frankfurter Tor is a modern medical care centre with over 20 years’ experience in the fields of diagnosis and treatment. Ever since its inception, it has been guided by the concept of a holistic and patient-oriented treatment process. That means that the doctors (radiologists, nuclear medicine specialists, radiotherapists) work as a team to provide optimum treatment that is fine-tuned to patients’ needs, in the course of which their questions can be answered at any time, quickly and easily, by a competent contact person. Since 2009, the DTZ, with its own radiochemistry facility, has been able to source all the substances needed for diagnostic procedures in-house. Pain is invisible to the human eye. 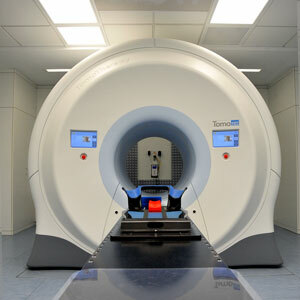 To discover the causes behind it, at the DTZ we use multiple imaging methods to help the doctor see inside the body. 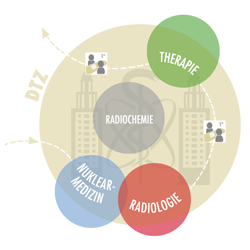 At the DTZ there are two kinds of imaging procedure: On the one hand, conventional diagnostic methods such as CT, MRT (radiology) or scintigraphy (nuclear medicine) can depict ‘classic’ diseases reliably. On the other hand, specific disorders can be diagnosed accurately using innovative combined procedures, such as PET/CT, PET/MR, SPECT/CT and SPECT/MR. At the DTZ we make a basic distinction between two kinds of treatment: treatment of benign, predominantly inflammatory or degenerative, disorders and treatment of malignant cancers. We can treat both reliably and in a targeted manner using our modern equipment at the DTZ centre for radiotherapy in Berlin-Friedrichshain.